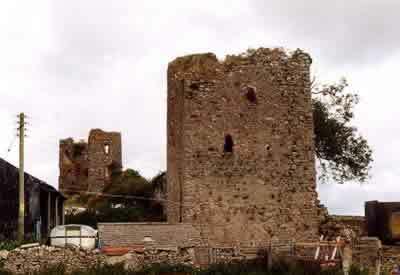 Gleaston Castle is a mid to late 13th century stone enclosure fortress, founded by John de Harrington. By tradition the castle was built on the site of an earthwork motte and bailey fortification and damaged by the Scottish raids of 1316. In the early to mid 14th century, it appears that the quadrilateral curtain wall was repaired, extended and flanked with angle towers. Standing at the highest point, the rectangular north-west tower was probably completed in 1340 and this large self-contained residence defended an adjoining gateway. After the castle passed by marriage to Lord Bonville of Shuton in 1457, it ceased to be a manorial dwelling and was soon abandoned. Three of the angle towers and substantial lengths of all but the northern curtain wall survive. 2 miles south-east at Aldingham is Moat Hill and 4 miles north-west is Dalton Castle.